Make your breakfast and desserts healthy with this mouth watering dish. Made with layers of fresh fruits, yoghurt, custard and honey coated oats; this recipe is not only filled with goodness of nutrition but is also really tasty. • In a bowl, stir homemade vanilla custard and yoghurt together and keep aside. • Heat a non-stick pan on medium heat and toast rolled oats for a minute. • Add honey to the oats and stir on medium heat until the oats become slightly crispy. • Beat 2 tablespoons of jam with 2 tablespoons of water and keep aside. • Take 4 tall glasses or small bowls. Add some oats to the bottom of the glasses and reserve some for the topping. Place a layer of mixed fruits on it. 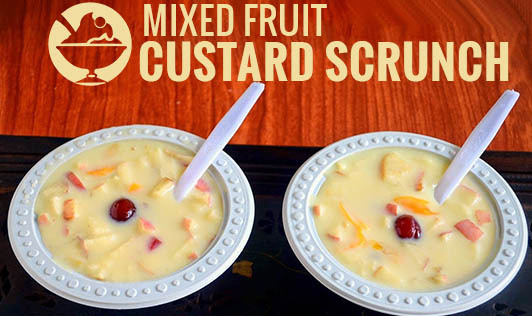 Now pour the custard on the fruits. Drizzle some jam and repeat a layer of fruits and custard. Lastly, sprinkle the remaining toasted oats. • To make homemade custard, make a paste of 1 tablespoon of vanilla custard powder with 2 tablespoons milk. On medium heat, boil 2 cups of milk with 1 tablespoon sugar. Add the custard powder paste to the boiling milk and stir continuously till it reaches a slightly thick custard consistency. • You can replace sugar and jam with honey or date syrup or reduce the quantity of sugar used to make it healthier.